← First gig this week! My Ibanez RG550 loaded up with Floyd Upgrades brass block goodness. The guitars I mainly like to play are Ibanez RGs with floating tremolos. The necks are perfect for my hands, and the bodies feel comfortable sitting down or standing up. The one problem I’ve had with them is the tremolo units. Don’t get me wrong, Ibanez build some of the best Floyd Rose type bridges out there, with many great innovations. The one issue is of tone. It’s all well and good building a fantastic tremolo system that holds tune after constant whammy bar abuse, and feels comfortable on the picking hand. The issue is to do with the sustain block, it just isn’t that great. Little pot metal sustain blocks are cheap to manufacture, but they just don’t help a guitar that’s already going to have a thinner tone due to the big hole in the guitar required to allow lowering and raising of pitch via the Floyd Rose type tremolo. You can dial in a thicker tone on your amp, but it’s still not the same. As they say, there’s just no substitute for mass. Thankfully Adam Reiver of Floyd Upgrades has the solution for this. Adam, and Floyd Upgrades have become well known for providing sustain blocks (amongst other great parts) to solve these sorts of Floyd Rose tone issues. His range of brass and titanium big block upgrades will cover most models of Floyd Rose type bridges, providing them with fuller, louder tone, more akin to hard tail guitars. Adam was kind enough to send out a 32mm brass sustain block for the Ibanez Edge for me to test and review. Floyd Upgrades brass blocks are made of the highest quality bell brass, and are typically twice as thick as the stock sustain block. Just looking at it you can tell you are going to get a nice upgrade in tone. The brass sustain block is also quite a bit heavier than the stock Ibanez block. Installation is a lot easier than many may think. You don’t need to totally disassemble the bridge to remove and replace the sustain block. I first remove the bridge from the guitar by removing the springs. I then take measurements of the positions of the A, D, G and B saddles to make sure I can set the intonation correctly after installing the new block. All you need to do from here is loosen the screws holding the A, D, G and B saddles in place, and move the saddles out so they are free from the base-plate. The strings can stay in the saddles. Underneath these four saddles you’ll find the three screws holding the block in place. Remove them, take the old block away, and install the new Floyd Upgrades brass block ensuring you align the block, and the tension spring plate so the screw can pass through each part. Put everything back together, ensuring you use your measurements to set your saddles in the correct place, and hook the bridge back up to the guitar. The first thing you might notice is that the bridge is not sitting quite parallel to the body of your guitar. This is due to the increased mass of the new Floyd Upgrades brass block. Tighten up the spring claw a quarter turn at a time until the knife edges are parallel again, and then re-tune your strings. Upon installing the Floyd Upgrades brass block the difference in tone is immediately apparent, both acoustically and plugged in. My Ibanez was louder, and had a much fuller tone. The low end was far fatter than I had expected, and the mids were boosted and warmer than with the stock block. Notes really jumped out of the guitar, with a more defined clarity to them. Sustained notes lasted longer, and had more fullness to them. Harmonics really popped out of the guitar, Dimebag style harmonic were louder and fuller too. Throwing in a heavier, fatter brass sustain block is going to change the dynamic of your Floyd Rose type bridge. My Ibanez Edge did feel a little heavier, but not in a bad way. If anything using the whammy bar felt a little more solid, in a way I quite liked. There was a slight restriction in the amount I could pull back on the bridge, but nothing that was going to bother me as I only typically go for a full step up in pitch. If this is a problem you can always open up the cavity a little to give yourself more room. Here is a demo video of me playing one rhythm and one lead part, (hopefully) showing the difference in tone between the stock, and Floyd Upgrades brass block. Unfortunately I only have a cheap microphone, but I hope that it captured the increase in volume and sustain, added clarity, and fullness of tone that the Floyd Upgrades brass block gives to the guitar. Overall I have found the Floyd Upgrades brass block a very worthwhile upgrade. My Ibanez now sounds far closer to a hardtail guitar, with more volume, and fullness of tone. Notes now really pop out of my guitar with far greater definition. The only issue now is I really need to try a titanium block, and find out how it sounds compared to the brass block! 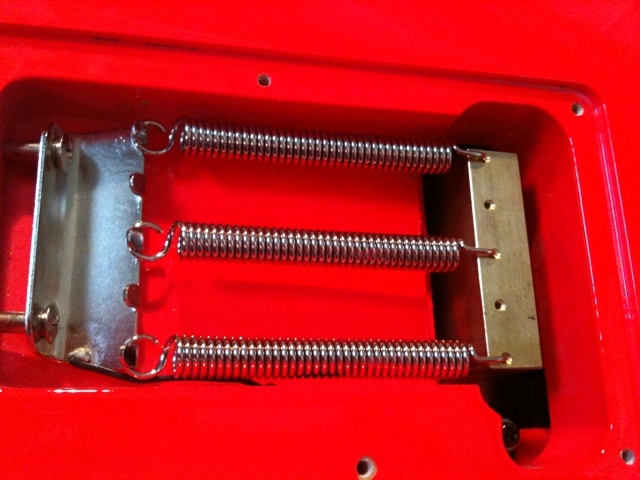 3 Responses to "Floyd Upgrades Brass Sustain Block for Ibanez Edge – review"
Hi, are you the lonephantom from dimarzio forum? Btw, wanna ask you is the big block installable for the edge PRO? Hey guys, i bought the brassblock from killerguitarcomponents.com for my RG470 with the Edge (the original) tremolo. It locks the springs to the block just like the original block. I can tell a difference between the old and the new block too. And it looks really nice too 🙂 .